There’s no doubt that wine, like almost everything it seems, is subject to cycles of fashion: oaky Chardonnay’s time has passed (for now at least), whilst rosé wine is all the rage; Merlot is infra-dig, whilst Pinot Noir is the coolest name in town. The changing public appetite for certain grape varieties, countries or wine styles can thrust some surprising candidates into the spotlight. Who would have thought rosé would strike it so big, that Grüner Veltliner would hit the mainstream, or that Italy’s often anaemic Pinot Grigio would become a massive popular success? Meanwhile, there are regions, grapes and styles that have slipped out of favour. Waiting in hope that the winds of fortune will change, think Beaujolais, Muscadet or Sherry for example. One other wine that is most definitely consigned to the chorus-line, is Vinho Verde. It may be one of Portugal’s most identifiable wines, but it is languishing in the doldrums. Vinho Verde is a region that hugs the Atlantic coast, running north from the city of Porto, extending way up to the Spanish border at Galicia. This is beautiful countryside, of small farms and woodlands scattered with tiny villages, and everywhere there are vines, crammed into back gardens, straddling the roadside, climbing through church yards. The vines are trained high on pergola trellises – an eminently practical arrangement that allows the smallholder to grow a second crop beneath, most commonly maize. It also gives the vines plenty of exposure to the breeze – essential in this often damp climate that is prone to frost in Spring and rot-causing humidity in summer. But this is the old face of Vinho Verde, which earned a dubious reputation for its wines. Typically the wines – harvested with enormous yields – where dilute, low in alcohol, and often fiercely acidic. After harvest and lying in the chilly cellars over the region’s cold winter, a second fermentation occured in spring because sugar was added to sweeten the wines. This created the sweet yet acidic, fizzy and low alcohol wines that found few friends in the sophisticated world of modern wine. There are 35,000 hectares of vineyards in Vinho Verde – and 38,000 individual growers, many farming backyard plots. And yet somehow, this unfashionable appellation made up of rural smallholders, has begun to get its act together in an extraordinary way. 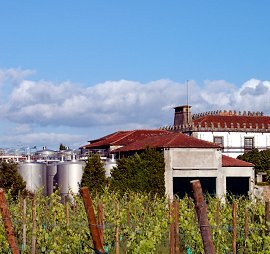 It is the only one of Portugal’s regions to fund a research centre, EVAG, that works on behalf of the entire appellation, studying grape varieties and root stocks, matching these to the soils of Vinho Verde’s nine sub regions, and researching training systems and other aspects of viticulture. 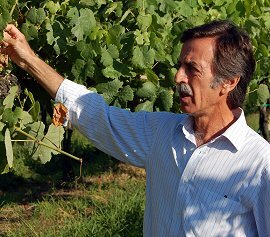 The overall quality of Vinho verde is on the up, and wines have started to appear on UK shelves that blow away Vinho Verde’s old – though deserved – reputation. Now most estates are looking for much better balance of fruit, acidity, sugar and alcohol. The biggest changes are in vine training, with the pergolas being replaced by other systems that still keep the vines well off the ground, but provide much better management of the leaf canopy and exposure of grapes to the sun. 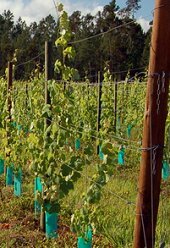 Young vines (left) are planted to be trained on wires. Yields have also been cut, though it is still a relatively high-yielding region, as are most which produce clean, crisp white wines. Many producers are focusing on replanting or grafting vineyards according to the outcomes of EVAG’s trials: It’s 18 hectares of research vines include all 52 permitted Vinho Verde grape varieties, partly to keep a genetic bank, and partly to furnish eight nurseries aligned to its vine breeding programme. There are trials of different training systems, clonal selections, root stocks and organic farming. In fact there are 180 varieties planted here in total, with experimental blocks of Sauvignon Blanc, Chardonnay, Pinot Noir and Merlot all showing promise. The Loureiro grape has become increasingly popular amongst some of the better producers of Vinho Verde, including the estate of Quinta de Azevedo, part of the large wine company Sogrape. Sogrape made its fortune with Mateus Rose, a brand that is still central to the company, though Sogrape now has a portfolio of more prestigious wines, including Quinta de Azeveda, the Callabriga range of Douro, Dão and Alentejo table wines, the premium Douro table wine Barca Velha and Sandemans Port. Under DOC regulations, Vinho Verde wines have a maximum of just 11.5% ABV. If a wine is bottled with an ABV greater than 11.5%, it must carry the name of a specific sub-region, not just ‘Vinho Verde’. The DOC covers white, red, rosé and sparkling wines – also vinegars and Eau de Vie. There are also regional wines (a bit like France’s ‘Vins de Pays’) and plain table wines. Soils in Vinho Verde are around 60% granitic, and 40 slate, but all vineyards all planted in granitic soils. This is the opposite situation to the Douro, where granite is shunned in favour of slate. Drip irrigation is permitted, but rarely used as there is normally plenty of rain. Attached to the back of the stunning 12th century Quinta is a new winery, built and continually upgraded since Sogrape bought and refurbished the estate in 1982. Grapes are moved gently on conveyors, and pass through pnuematic presses – but only after 12 hours skin contact for the best quality Loureiro grapes. Vasco tells me that fermentation uses a yeast called QA23, developed from ambient yeasts of the property, and now sold all over the world for white wine ferments. Sogrape produces a small range of Vinho Verde wines, some from Quinta de Azevedo’s own fruit, and others from fruit bought in from growers. The widely available Quinta do Azevedo is a fine example of ‘modern’ Vinho Verde, and the single varietal Alvarinho from the sub-region of Monção shows a more serious, structured side to the appellation. Stevens Garnier is the UK distributor of these wines. They can be found mostly in independent wine merchants, though the excellent Quinta de Azevedo (a former Wine of the Week) is in wider distribution. For all stockists see wine-searcher.com. Non vintage wine, but generally from the most recent vintage. 9% alcohol, spritzed with C02 before bottling. Very pale colour and pretty nose of apple and light floral notes. A touch of lemon sherbet. The palate has that lemon sherbetty brightness, and is lovely, crisp, mouthwatering acidity playing against ripe pear fruit and 12gl of residual sugar. 85/100. 70% Loureiro, 30% Pedernã, with 5gl of residual sugar and just a touch of added C02. Beautifully fresh, quite limpid pear fruit on the nose. A touch of waxy, leesy character and floral aspects. The palate has a little more richness, but a lemon rind bite and again a fine, verve and cut of acidity. With persistent fruit. 88/100. £5.49 – 5.99, Majestic, Wine Society, Waitrose. Similar grapes and proportions to the Quinta de Azevedo and again 4 or 5gl of RS. Limey and a touch of passion fruit, with a big core of lime and lemon streaked acidity, that is reallly pithy and dry. Nice food friendly stuff. 87/100. Quite a skin-contacty, apple and pear skin nose. A faint smokiness. The palate has a distinctive, waxy quality, with pithy grapefruit and lemon acidity. There’s an orange and vivid, Riesling-like character here. More profound perhaps than the Azevedo, with more concentration and ripeness at 13% and only 2g/l sugar. 88/100.